As a key university in China, Beijing Institute of Technology (BIT) is located in the metropolitan city of Beijing which boasts of both a long history and modern features. As the birthplace of mandarin, Beijing is a marvelous place to learn Chinese, and BIT is an exceptional destination. Equipped with excellent teaching facilities and a beautiful school environment, BIT provides the perfect opportunity for international students to get in touch with the traditional culture and history of China and brings them nearer to places of interest and natural scenic beauty. Class size is limited to 20 students. 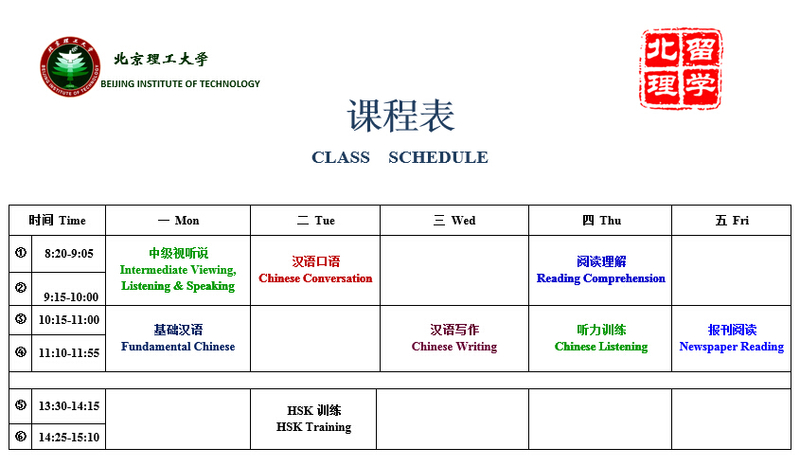 Courses are scientifically arranged, including not only compulsory courses of Comprehensive Chinese, Chinese listening, speaking, and reading, but also distinguished ones such as Words and Pronunciation Training, Chinese Culture, Chinese Idioms and Set Phrases, Overall of Modern China, Chinese Science and Technology, Newspaper and Periodical Reading, Advanced Writing and others. Furthermore, BIT invites many experts to give free lectures on HSK, Tai Chi, calligraphy, and culture. Through intensive instruction and repeated practice, students can improve their overall linguistic ability. To enhance the effectiveness of classroom instruction, we also organize many interesting activities for student to practice their Chinese language skills. Field trips may include visiting the Great Wall, Summer Palace, Xiangshan, Beijing Capital Museum, Yuyuantan Park, China National Museum, Beihai Park, 798 Beijing Art Zone, and other places of interest. Free lectures are given about calligraphy, Chinese traditional painting, paper cutting, photography, Chinese music appreciation, and Chinese classical movie appreciation. Culture and sports competitions may include badminton, volleyball, oral Chinese, singing, photography, writing, long distance walking, and an international culture festival. Such events offer students’ chances to exhibit their current language ability. They also greatly arouse their enthusiasm to more fully learn the Chinese language and culture. Applicant should be above 18 years old, having a high school or higher degree with good health condition. They must abide by the laws of China and the regulations of school. ③If applicant has been studying in China, a certificate for permission to transfer by the current university is needed. After being admitted, our school will mail the Visa Application for Study in China (JW202 form) and the Admission Notice to the student. Student then goes to the Embassy or Consulate of People's Republic of China with the Admission Notice, JW202 form, passport, and Physical Examination Report to apply for an X visa to study in China. If the duration is less than six months, the applicant may apply for the F visa (There is no need to take physical examination for the F visa).